Many of those who fight for the Rebel Alliance have little actual military experience, joining up based on their hatred of the Empire alone. Others, however, have honed their instincts in the trenches, enduring countless hopeless battles on desolate worlds in the name of the Alliance. Soon, you’ll be able to reinforce your Rebel armies with the most experienced soldiers the Rebellion can offer. 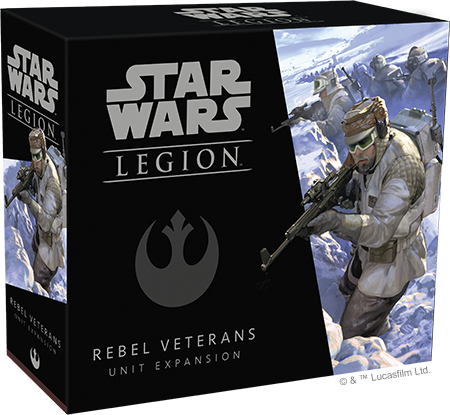 Fantasy Flight Games is happy to announce the Rebel Veterans Unit Expansion for Star Wars™: Legion! Armed with little more than their blaster rifles and grim determination, Rebel Veterans are often assigned the hardest and most vital jobs in the war against the Empire. 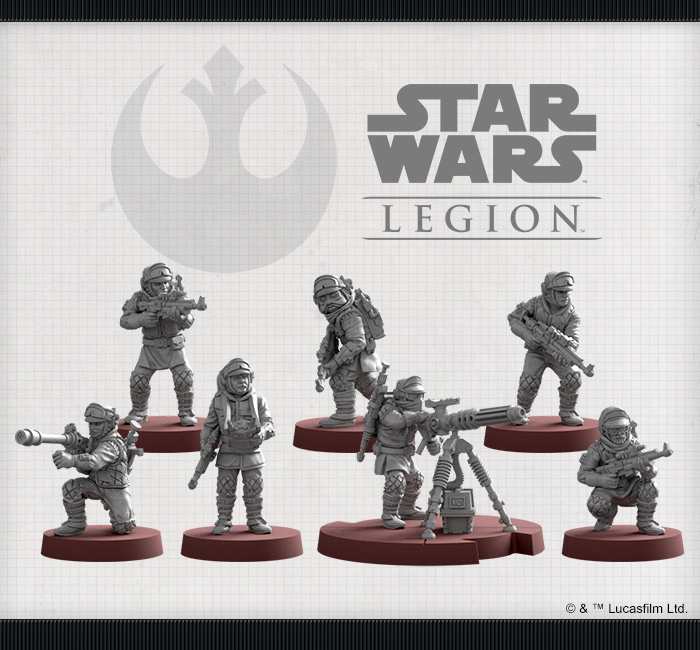 Within this expansion, you’ll find seven unique, unpainted Rebel Veteran miniatures to add to your collection, including a Mark II Medium Blaster Trooper miniature that can be deployed as a detachment, offering valuable fire support to all of your units. 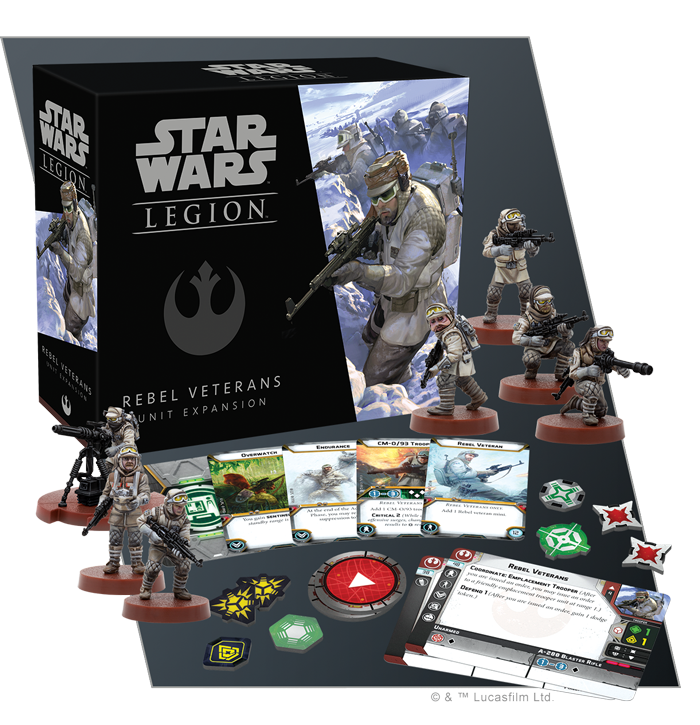 Accompanying these miniatures are two unit cards, a selection of upgrade cards to outfit your veterans with new weapons and gear, and all the tokens you need to add them to your Rebel armies! The battles of the Galactic Civil War are won and lost in the trenches, by the units that form the bulk of the Rebel and Imperial armies. Always reliable, the Rebel Veterans give you another option for the corps units that form the backbone of your army. They can be counted on to get the job done, to hold the line, or to fight to the bitter end. Despite facing a massive onslaught of Imperial walkers at the Battle of Hoth, these fighters held firm, buying time for their transports to escape and making the Empire pay a bitter price for every foot of ground it gained. Appropriately, then, Rebel Veterans are resilient units prepared to fend off any Imperial offensive. They become even more prepared to hold their ground once you issue them orders, as they dig themselves in to form a study defensive front. Like the Rebel Troopers they fight alongside, squads of Rebel Veterans carry the standard issue A-280 blaster rifles commonly seen among Rebel units. Unlike their fellow Rebels, however, the veterans have different tastes when it comes to diversifying their arsenal. Where a group of Rebel Troopers might look to slow down an enemy vehicle or lay down a high volume of fire with a Z-6 rotary blaster cannon, a veteran CM-O/93 Trooper aims to stop an advancing enemy in its tracks by dealing as much damage as possible. No matter what heavy weapons they choose to equip, the Rebels have little hope of success if they don’t work together to push back the Imperial onslaught. Perhaps the Rebel Veteran’s biggest contribution to your efforts, then, is their willingness to work with other units. For example, they can easily coordinate with a nearby emplacement trooper unit like a 1.4 FD Laser Cannon Team to ensure that everyone is ready to return fire. But if stationary laser cannons aren’t part of your battle plan, you can also assign a Rebel Veteran to man a Mark II Medium Blaster and maintain a bit of mobility with your heavy firepower. Rather than act as a heavy weapon upgrade, this miniature becomes its own unit that can only be deployed as a detachment from the Rebel Veterans. Once on the field, however, the Mark II Medium Blaster Trooper is free to aid the ranged attacks of any friendly unit. We’ll have much more information about the Rebel Veterans and the heavy weapons they employ in battle in a future preview!